When building your own cabinets or measuring for new replacement cupboard doors in your existing kitchen or bathroom, this method works perfect. You are going to need to determine the overlay of your hinges before doing anything though. Every cupboard door hinge has a particular overlay. It is simply the distance that the door extends past the inside of the cupboard’s edge. 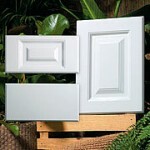 You must know this dimension before ordering your new kitchen or bathroom vanity doors. Thinking about changing the look of your kitchen by installing new doors? Do you want to do it yourself (DYI)? There are a few things you will need to learn prior to taking on the project. I’ve written many articles that are linked in this post that will help you with different situations you may encounter. This video demonstrates how Blum cabinet door clip hinges operate. When removing cupboard doors, most people are not aware of the simplicity of this system. Toward the back of the mechanism there’s a small metal tab that needs to be lifted in order for it to release from the plate. It takes less than five seconds to release one and to snap it back into position. I’ll admit, it is a little tougher than the demonstration to get it to snap into place. If the plate is not at a perfect ninety degree angle and the hinge is, it hard to get the two to match properly. Usually, you have to push up or down on the hinge to get it to clip properly. Just about all cabinet hinge manufactures make this style European hinge. 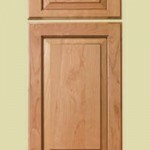 There are many methods of how to upgrade cabinet doors. The style of the kitchen, bathroom or vanity door will determine the upgrading process. If you have a raised panel style, consider applying a glaze to add more detail. Formica kitchen Cabinets generally have flat fronts and look good when additional moldings are applied or glass frames are inserted. The video shows how to fix loose MDF, vinyl wrap or Thermofoil cabinet door edges. These plastic kitchen or bathroom vanity door edges can be re-glued with Elmers glue. Sometimes you can repair them without taking them off of the cupboards.